4) Write a clemency letter to the Texas Board of Pardons and Paroles and to Governor Greg Abbott. Send the letters separately to each of their addresses. Short case summary: At approximately 6:00 a.m. on Jan. 2, 1996, while Wood waited outside, Reneau entered the gas station with a gun and pointed it at Kris Keeran, the clerk standing behind the counter. Reneau ordered him to a back room. When he did not move quickly enough, Reneau fired one shot with a 22 caliber handgun that struck Keeran between the eyes. Death was almost instantaneous. Proceeding with the robbery, Reneau went into the back office and took a safe. When hearing the shot, Wood got out of the car to see what was going on. He walked by the door and looked through the glass. Then he went inside, and he looked over the counter and ran to the back, where Reneau was. Wood was then ordered, at gun point by Reneau, to get the surveillance video and to drive the getaway-car. Good article by a Sam Houston State University student for the college paper about Adam Ward, a mentally ill man, who was executed last night. Thankfully he wouldn't allow his parents, Nancy and Ralph Ward, to witness the execution as they were having a very difficult time with losing their only son. Two Abolition Movement members who had known them for many years, Angie and Gloria, met them afterward and offered condolences at the local church where the funeral home takes the body so family and friends can say good-bye. Kathy Cox, a former Salvation Army minister, witnessed he execution, as she had known the Wards and visited their son for many years and was staying with them in Huntsville. His mom, Nancy, collapsed several times as she wailed and touched her son's warm yet lifeless body. It was such an emotional, yet needless scene--another reason for the end of the death penalty. Despite arguments that he was ineligible for the death penalty due to his severe mental illness, Tuesday night the state of Texas executed Adam Ward for the 2005 murder of a code enforcement officer. Ward insists he was defending himself when he fatally shot code enforcement officer Michael Walker, who was taking photos of possible code violations outside the Ward family home in Commerce, about 65 miles north of Dallas. Ward, 33, was put to death by lethal injection March 22 at the Huntsville Unit, just one street block away from the Sam Houston State University campus. Outside the nation’s most active execution chamber, 15 to 20 protestors stood holding signs opposing capital punishment and held public prayers. Danielle Allen of Cleveland, TX is also a code enforcement officer and was outside protesting the execution, despite the death of another officer. Ward is the ninth person executed this year and the fifth inmate executed in Texas; 535 inmates have been executed in Texas since 1976. Walker, 44, began taking pictures of the Ward’s family home to document code violations resulting from the piles of junk outside the house which led to an argument between Walker and Ward, then 22. Ward intervened and told Walker to leave the property. Walker waited nearby after calling for assistance, but he was unaware that Ward had gone inside the house to grab his gun. Walker died after sustaining nine gunshot wounds from Ward’s .45 caliber pistol. Ward confessed to the murder soon after, stating that he shot Walker because he feared for his life. Ward’s parents were not present at the execution at the request of Ward who said he did not want his parents there to witness his death, according to Gloria Ruback of Houston, who stood holding an “abolish the death penalty” sign outside the prison. Last week, Ward’s lawyers filed an appeal with the U.S. Supreme Court asking the high court to overturn a March 16 decision from the Texas Court of Criminal Appeal’s denying a stay of execution for Ward. In the appeal, his lawyers argued that Ward committed a murder because he suffered from “delusions and paranoia fed by his disabling bipolar disorder” dating back to his childhood. Longmire said southerners tend to believe in the death penalty and make little exceptions, including mental illness. From age three, Ward was prescribed psychiatric medicines to address his aggressive and destructive behavior. After spending two and a half months in a psychiatric unit when he was four-years-old, Ward was diagnosed with bipolar disorder, according to the appeal. Ward’s mental illness continued to plague him as he began school, the appeal argued. By the time Ward was in second grade, his school had built a “Time Out Box” – a small, padded isolation room – specifically for him. According to a neuropsychological evaluation in middle school, Ward suffered from “rage episodes,” during which he was unmanageable for an hour or more, had a low frustration toleration and a high level of insecurity and tendency to interpret incoming information as persecutory. Court documents described Ward’s father, Ralph Ward, as a hoarder who filled the family’s home with piles of junk and an arsenal of guns and ammunitions. Both father and son suffered from shared delusions and paranoia. The two delusional men believed the city of Commerce was out to get their family and the government was controlled by the “Illuminati.” However, court documents revealed the Ward family had in fact received numerous city code violations for junk piled inside and outside the house. “Ward’s aggressive and antisocial behavior continued and escalated through adolescence and into adulthood, culminating in him fatally shooting Code Enforcement Officer Michael Walker on June 13, 2005,” Ward’s appeal argued. The Supreme Court has ruled that mentally ill prisoners, generally defined as those with an IQ below 70, may still be executed if they understand they are about to be put to death and why they face punishment. According to the state’s lawyers, evidence showed Ward’s IQ was nearly 123. “To qualify as Not Guilty by Reason of Insanity by virtue of mental disease or defect he has to either not understand the wrongfulness of what he’s doing or not be able to control himself even if he knows it’s wrong…that’s the mental illness,” Longmire said. According to Longmire, the type of people who commit heinous crimes such that of Ward are largely the product of two factors: rage and guns. According to Longmire, Ward is not the type of person who has the mental capacity to commit premeditated murder. “In order for someone to able to stop and deliberately say ‘I am going to kill someone’ and do it with pleasure and a sense of purpose, you’ve got to work for the State of Texas and you’ve got to be on the execution team because that’s what they do,” he said. 2. Despite the fact that he specifically requested to speak with the Nicaraguan Consulate and the authorities had full knowledge of Tercero's status as a foreign national, they denied him his right under the Vienna Convention of Consular Relations (VCCR, article 36). British attorney Peter Bellamy and Tercero petitioned the Inter-American Commission on Human Rights to intervene in this case. Bellamy was notified on July 6 that the IACHR accepted the petition on its merits and will investigate the case. The IACHR has renewed the "protective measures" status of Bernardo which imposes responsibilities on US authorities not to carry out the execution pending the outcome of the Commission’s investigation of Bernardo's petition. There have been multiple systemic failures in Tercero’s case, beginning with his arrest and continuing today—a lack of due process at every stage of prosecution, defense, and post trial appeal. Until there is a remedy to these, Bernardo's sentence must not be carried out. 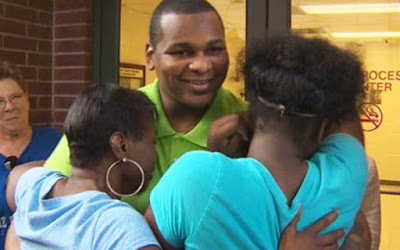 After more than ten years on Texas death row for a crime he did not commit, Alfred Dewayne Brown walked free and into the loving arms of his family and friends on June 8, 2015. "I went in an innocent man and I came out an innocent man," said Brown. Now, he needs your help so that he can rebuild his life. Every donation makes a difference. Will you please help him? Dewayne's life changed forever on April 3, 2003. It was on that day that Dewayne was falsely accused of a horrible crime which resulted in two deaths. Despite the fact that Dewayne tried to tell the Houston, Texas police that he was at home during the incident, they chose to believe two men who did not want to turn in their buddy, so they "fingered" Dewayne. A series of events took place that Dewayne could not control. He told anyone and everyone that he was home and the landline phone records would prove it because he had called his then girlfriend at work when the news came on. It was these phone records that would be the pivotal point in the release of Dewayne. The Grand Jury argued with Dewayne and threatened his girlfriend with jail time and with taking her children away from her if she did not change her story. She buckled, the DA hid the phone records and Dewayne was sent to Death Row. Nothing impressed the Harris County DA and Dewayne was left with the thought of lethal injection for a crime he had nothing to do with. Appeals were filed and in 2007, the law firm of K&L Gates took the case, honing in on the lost phone records. It took the attorneys six years to find them - IN THE GARAGE OF AN INVESTIGATOR. The DA in 2007 stated that failure to disclose the records "was inadvertent and not in bad faith. It was one piece of paper". The trial judge signed orders for a new trial, the Texas Court of Criminal Appeals threw out the conviction and ordered a new trial in November 2014. Dewayne spent 12 years, 2 months and 5 days behind bars for something he had no part in. That is 4,449 days or 106,776 hours of his life that was stolen from him. Nearly every one of those days were spent in solitary in a cell no larger that a small bathroom. Living with the fact that he could be executed any day. Torn away from his family, not being able to be a father to his daughter. For this, the State of Texas needs to compensate Dewayne. But, because of the "clever" wording in the paperwork when Devon Anderson declared that Harris County has no evidence against Dewayne, it will be an uphill battle to win compensation. A battle that will not be won any time soon. This is where the people of the world come in. Dewayne needs your help now to get on his feet. He needs to rebuild his life that Harris County and the State of Texas stripped from him. Going straight from solitary to the "free world" is no easy task. He needs time to adjust being able to make decisions on his own, at a pace that is comfortable to him. We can never give these years back to Dewayne. But, we can help him manage more comfortably. Please give what you can. Everything makes a difference. This fundraiser is being conducted with the consent of Dewayne Brown, who will receive all funds raised, minus the 3 percent charged by the credit card processing company. We have also obtained consent from Dewayne's legal team. While Indiegogo Life doesn’t charge a fee, payments are handled by third-party processors who charge a 3% transaction fee. At the end of the 30 day campaign, the donations will be transferred directly from the life.indiegogo.com system to a bank account set up by Dewayne's legal team for his exclusive benefit. Texas State Senator Eddie Lucio, Jr has filed legislation to abolish the death penalty in Texas. This is the first time a state senator has ever filed legislation to abolish the death penalty in Texas. It happened because organizations in Texas held the Statewide Texas Lobby Day to Abolish the Death Penalty on March 3 and death row survivors Ron Keine and Sabrina Butler from Witness to Innocence and Scott Cobb of Texas Moratorium Network met with Senator Lucio's general counsel and requested that the Senator file abolition legislation. In the coming weeks, we will be working with Senator Lucio's staff as well as staff of the House sponsor of the abolition bill, to prepare for committee hearings on the abolition bills. When a hearing is held in the Senate Committee on Criminal Justice, it will be the first time ever for a hearing on abolishing the death penalty in Texas. It will be up to the chair of the committee to decide if a hearing is scheduled.